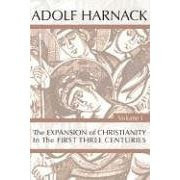 Harnack, Adolf. The Expansion of Christianity in the First Three Centuries. Vol. 1. Eugene, Oregon: Wipf and Stock Publishers, 1998. These words of Jesus have shone so brilliantly for many generations in his church, and exerted so powerful an influence, that one may further describe the Christian preaching as the preaching of love and charity. From this standpoint, in fact, the proclamation of the Saviour and of healing would seem to be merely subordinate, inasmuch as the words “I was sick, and ye visited me” form but one link in the larger chain.